What is the future of Turkey now? We discuss it with the director of a prestigious private school in Istanbul. As the cloud of uncertainty seems to thicken over the plotted nature of Turkey’s failed coup, purges in the country are intensifying at this very moment. After military, police and magistrates, it is time for the schools, both public and private, to be in the middle of the eye of Erdogan’s storm. What lies ahead now? We discuss it with the director of a prestigious private school in Istanbul, who asked to remain anonymous for security reasons. For more information on Turkey, read our selection of articles. What really happened in Turkey? Do you also believe in the theory claiming that the coup was specifically concocted to increase consensus on Erdogan’s Government? “It is hard to say. In my opinion, this was not a fake coup. Many people close to me doubt that it was real. Anyway, nobody expected it. In your opinion, were the latest news about the Government of Erdogan warning signs? I refer to the appointment of Binali Yildirim as a new head of Government, which a loyal to Erdogan, as well as the increasing the military pressure on the Kurdish party PKK, which reinforced the armed repression. Other examples are the announcement of reconciliation with Israel, the apology letter sent by Erdogan to Russia’s President, Vladimir Putin, the Turkish resumption of a central role in NATO, as well as Erdogan’s new approach to the Syrian regime of Bashar al-Assad. As a school director, you are in direct contact with the younger, Turkish generation. What is the mood now? How do you see the reaction of young students in relation to events that are occurring in the country? “The majority of students attending foreign schools belongs to Kemalist élite, whose main reaction is total despair. As an indicative sign, only between 10-15% of our school graduates decided to further studies abroad in the past, while now the percentage has more than doubled. About 40% of my students have chosen to leave because they don’t want to live in a country drifting toward Islamism. In some neighbourhoods, social pressure against women is particularly high. Many, indeed, started wearing the veil again, went out less and do not drink in public. What emerges from the failed coup and the subsequent reactions clearly shows that today’s Turkey is a country deeply divided between Kemalists in favour of the secular nature of the State and political Islam supported by Erdogan’s partisans. In your opinion, are the core elements of the Kemalist manifesto, which promotes the country’s social and cultural reform against Islamism, cherished by people today or religion has increasingly taken a prominent role as a political tool in gathering people around the Akp? “The Akp party is the strongest movement and definitely the prevalent one. Political repression is extremely strong and resignation is prevailing – and not merely among the Kemalist élites. We Europeans are somehow more protected, as the only risk we take is being expulsed at most. While those who are the most in Turkey, who now want to leave the country, encounter difficulties in obtaining visas. Ongoing repression is affecting mainly the military and judges, but as evidenced by the purges of these days, intellectuals will be next. In light of recent episodes, don’t you believe that Europe has played an indirectly role in supporting Islamism? And how do you regard the hypothesis of Turkey accessing the European Union? “Yes, I believe so. Europe has not helped Turkey. Negotiations on the Turkey’s full membership in the EU have been postponed since 2005. If Turkey were in the European Union, the country wouldn’t be as it is nowadays. Europe has responded Erdogan’s will to enter the EU by closing its doors and now Turkey looks more and more towards Arab States. 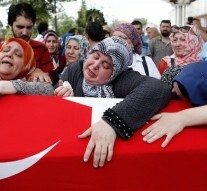 How does the member of the European Community in Turkey live this situation? “There is a general feeling of dismay and resignation. The majority of foreigners wants to leave the country. In my school, 10 professors have already gone away, while those who were supposed to come to replace them decided not to. I have been living in Turkey for 16 years, since 13 I have been living in Istanbul and since 4 I have been directing a private school. When I first arrived, the atmosphere was of greater openness, tolerance and secularism. However we shouldn’t simply demonise Erdogan. It should be noted that for certain social classes, he has done a lot, given a voice to the less privileged groups. Even the same Kemalist élites were not excluded from the wealth attained in recent years, when the growth rate was up to 10% yearly. In addition, Erdogan comes from a humble family. Before becoming Prime Minister he was Mayor of Istanbul and he knows the reality of the city and its social diversities. He has obtained consensus by many parts of the population, especially those living in the suburbs and the countryside, who recognize themselves in him and in his politics. The Kemalist system itself is an artificial system specifically built to open the Country to the West and secularization. As such, it will work only if Europe acknowledges Turkey without erasing its culture. Europe is then as guilty as Erdogan of this drift towards authoritarianism. Despite being a foreigner, I always thought to spend my retirement years in Istanbul, a city that I love deeply and that I have been living day by day for 13 years. As of today, I am forced to come to terms with a reality turned upside down. The city appearance has radically changed and this painfully questions my decision to stay.